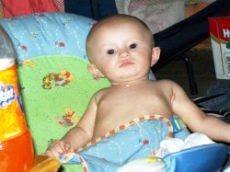 CHIPLEY, Fla. -- A 7-month-old infant has gone missing from her home in Chipley, a small town on the Florida Panhandle. The Washington County Sheriff's Office said Monday that Shannon Dedrick disappeared sometime between 3 a.m. and 11 a.m. on Saturday. Since then, about 75 search and rescue workers from three counties have exhaustively scoured the surrounding area. They were joined by K-9 teams and volunteers from local fire departments in a 14-hour search beginning late Saturday morning, and continued nonstop since 7 a.m. on Sunday. The arm-to-arm search has covered a 1/2-mile radius of Shannon's home, and deputies are expanding the area each hour. Shannon was described as 2-feet tall and 11 pounds, with brown hair and blue eyes.